RBTH has chosen six scenic routes designed to provide an introduction to the Ural region, which is worth visiting at least once in your lifetime. 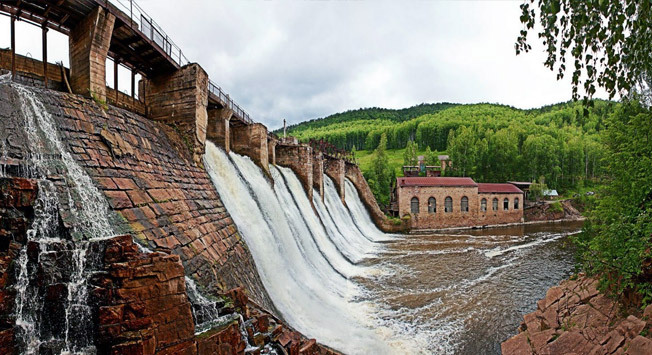 The oldest operating hydroelectric power plant in Russia is the Porogi station located on the Big Satka river in Chelyabinsk oblast. It has been running continuously with little or no upgrades since 1909. In 1993, it was added to the UNESCO world heritage list. The dam of this hydroelectric station is the only one of its kind not only in Russia, but also in the world. It was built by hand, with little or no use of modern equipment. The turbines of the plant are also unique, as they were custom made by leading European companies who spearheaded the push for global hydropower. The station's equipment is like a collection from a museum of the history of technology from the early 20th century. Back in those days the first Russian ferrous alloy smelter was built here. Today only about 20 people remain in the village of Porogi. There is a small private museum here as well. You can stay overnight at the Porogi hotel on the banks of the Ai river, 50 meters from the hydroelectric station. How to get there: From Yekaterinburg go in the direction of Chelyabinsk on M5 and then towards Bashkortostan, turn at the sign for Berdyaush village, and from there follow the dirt road to Porogi. There are two little-known and little-studied twin fortresses on the modern-day border between Chelyabinsk and Kazakhstan that were built in the 18th century during the period when Russia was settling the Ural region to defend itself against raids from nomads of the steppe. Long ago there were more than five fortresses standing every one hundred kilometers, and between them reduits were built. Today only the Nikolaev and Naslednitsa fortresses have survived from that line of fortifications. Crenellated walls surround the forts. Massive towers with loopholes stand in the corners, and steel gates are in the middle. A church is in the center and below are underground passages. Since both fortresses are located near the real border, you will need to have your ID ready. Near Nikolaevka, 3 km east of the village of Varna on the shore of an overgrown lake is the so-called Tower of Tamerlane - the Kesene mausoleum from the 14th to 16th centuries. How to get there: From Yekaterinburg go along the Chelyabinsk road in the direction of Troitsk, then through Stepnoye, Chesny and Varna and look for the sign to Nikolayevka. To get to Naslednitsa fortress, from Varna take the road to Kartali and Breda and then follow the sign to Naslednitsa. The Torum Maa Ethnographic Museum is in the hills of the Samarov Chugas in Khanty-Mansiysk. It was founded in 1987 through the efforts of Ugric writers. More than 6,000 exhibits acquaint visitors with the culture of the Ob-Ugric peoples, including household and hunting raised platforms (labaz), a smokehouse, a maternity clinic, fire pits¸ ovens for making bread, shelters for cattle, holy pedestals with seven sacred idols ... Today the museum hosts the Bear Festival (an ancient ritual connected with bear hunting), Crow Day (marking the return of spring), and performances by folk ensembles to celebrate traditional Ugric holidays. Visitors to Khanty-Mansiysk must try their traditional dishes of sliced whitefish served cold, venison, and cranberry jam. Khokhlovka is a unique open-air museum of wooden buildings situated on a picturesque hill on Varnach peninsula, 45 km from Perm. It boasts about two-dozen structures that date from the end of the 17th to the first half of the 20th century. Here you can see equipment from the Ust-Borovsky salt mines in Solikamsk, a watchtower from the Torgovishchensk defensive wall that was located on the Sylva River, and the last remaining wooden belfry (1781) in Perm oblast from the Syr village in Suksunm district. One of the prized exhibits is the Church of the Transfiguration (1707) from Yanidor village, Cherdyn district that survived to the present day, unlike many other centuries-old churches that burnt to the ground together with their parishioners during the time of mass self-immolations triggered by the struggle against the Old Believers. Khokhlovka hosts several annual public events such as the traditional Maslenitsa (Pancake Week) celebration, Trinity Sunday festivities, Savior of the Apple Feast Day, folk music festivals, military history events, and art festivals. Koptelovo is an ancient village on the banks of the Rezh river near the town Alapayevsk and is a rare "living" museum. It began with one peasant hut built in the late 17th century with an ax and not a single nail. A large family of 18 people once lived in the hut. The original interior has been preserved to the present day. On the territory of the museum there is also a 19th-century house, a large collection of agricultural tools, a crafts pavilion, and a blacksmith. All exhibits are from the everyday life of peasants from the 18th to 20th centuries. The rustic atmosphere reveals many interesting details about the daily life and traditions of a village in the Ural mountains. Visitors can ride around the village in a horse-drawn carriage or sled and hear Russian folk songs performed by a local ensemble. How to get there: Drive out of Yekaterinburg in the direction of Alapayevsk (20 km), and turn at the sign for Koptelovo. The total distance is about 150 km. Russia's only rehabilitation center for birds of prey is Kholzan, which is located in a picturesque area of one of the oldest settlements in the Urals – the village of Kashino. The center specializes in breeding and preserving endangered birds of prey such as eagles, falcons, vultures, golden eagles, and owls. Experts at the center treat wounded birds and then release them into the wild. Here you can see endangered and rare species of birds of prey; watch a falconry demonstration, which was a favorite pastime of the tsars; ride on horseback through the scenic forest accompanied by Russian greyhounds; or try your hand at archery. If you have time, you can walk along the beautiful green shores of Kashin pond or visit the Church of the Martyr Tsarevich Aleksei, which is a pilgrimage site for hundreds of believers and tourists from all over the country.